Our Stamina Monte Cervino Challenge was a beneficial climbing event to support great foundations with focus on nature and (climbing)animals. 20 year-old Monte Cervino-hall is shaped as the actual Matterhorn mountain which has 4478 meters altitude. Stamina dared climbers to actually climb 4478 meters in teams within 10 hours! This ment they had to climb at least 130 pitches! To save rainforests in Indonesia from deforestation and poaching! 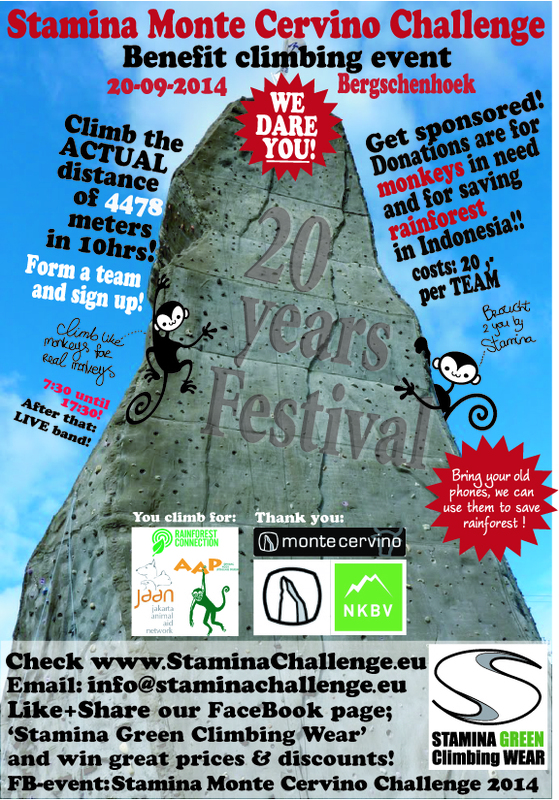 Final results: 600 euro for AAP Foundation, 600 euro for the Rainforest and 1081,59 for Jaan Foundation Indonesia! We donated a bit more to JAAN because although they are very succesfull in their actions, also they aren’t as wellknown (yet) as the two other organizations. In this event, we want to donate to Foundation Jaan. They rescue many ‘dancing’ monkeys which were forced to dance in the streets of Jakarta under violent circumstances, often with a mask or a doll head pressed tightly over their heads. Traumatized they arrive at Jaan where they are safe and after a while being carefully introduced to fellow monkeys. Slowly the monkeys adapt to more natural environment, and the goal is to release them back into nature. We want the monkeys to climb forever in freedom! Climb like a monkey 4 the real monkeys! We also want to contribute to the preservation of the rainforest by supporting sensors made from old mobile phones to detect illegal logging. The sensors are attached to jungle-trees, to capture the sound of chainsaws or gunshots of poachers. These sensors send a warning signal to park-officers who can check out what’s going on! That’s why we ask you to bring your old phones, we will collect them and make sure they will be used for a good cause!